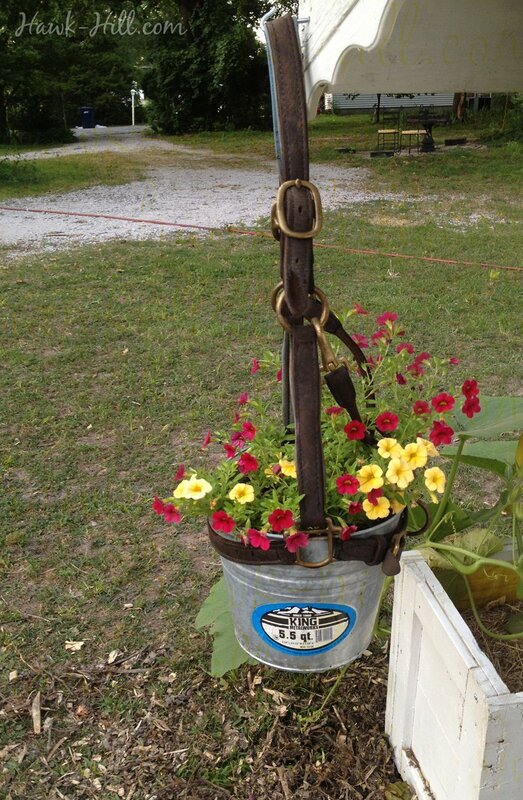 One of the most frequently Pinterest pinned images from this site is this photo, above, from my chicken coop / barnyard, taken in the summer of 2013 (give or take a year), showing a an old leather horse halter that I converted into a hanger for a galvanized bucket of Calibrachoa flowers. 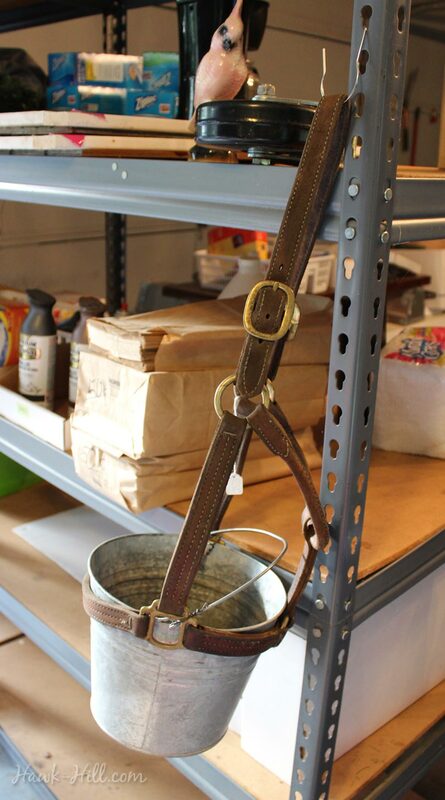 The noseband of many halters can be used as a support for varying sizes of buckets- the tricky part is finding the right bucket- if the noseband and bucket rim aren’t very similar in size, the bucket won’t drop fully into the halter, and, in my opinion, doesn’t look quite as charming. Today I’m going to walk you through some tips on how to make sure you get the right size bucket on the first try and then through simple steps for making sure your planter will stay secure even if the leather stretches or the bucket becomes heavier than anticipated. A good halter for this project is one that is worn but not worn out. 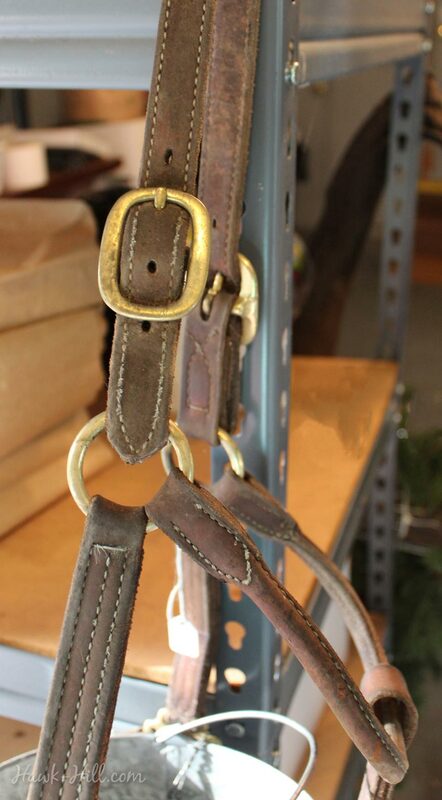 You can use a nylon horse halter but I love the rustic look and warmth of a well broken-in-leather halter. In fact, I used to buy average quality leather halters for my horses and use them during turnout for the purpose of supplying my used-horse-halter-crafting ideas. Cheap halters would break too easily, or the leather would crack before it took on an aged patina, and luxury leather halters were just too expensive for my budget, but a mid-range basic turnout halter made the horses look smart, easy to catch, and worked better than nylon if an emergency required the halter snap under pressure. If your leather is dry, you can condition with a leather conditioner or just spray with some cooking oil. 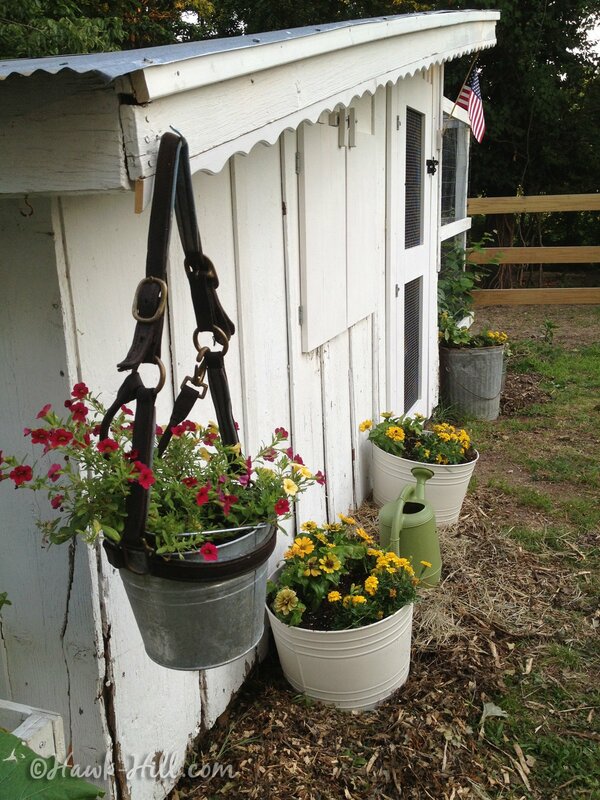 If you’ll be displaying your horse halter planter outdoors, you’ll want to take a moment a few times a year to oil the halter. A simple coating of cooking oil (applied only on days the halter is completely dry and has not recently been rained on) can extend the life of your halter planter by months or years. Oil replenishes and protects the leather fibers and helps it repel water. Finding a bucket that fits just right was harder than I expected. To get a good fit on the first attempt, take your halter with you to the farm store – don’t eyeball it. Lowes sometimes carries multiple sizes of galvanized buckets. It took a few tries before I found the perfect small metal bucket at Tractor Supply. Amazon has a selection of cool primitive style buckets that would add a lot to this project. 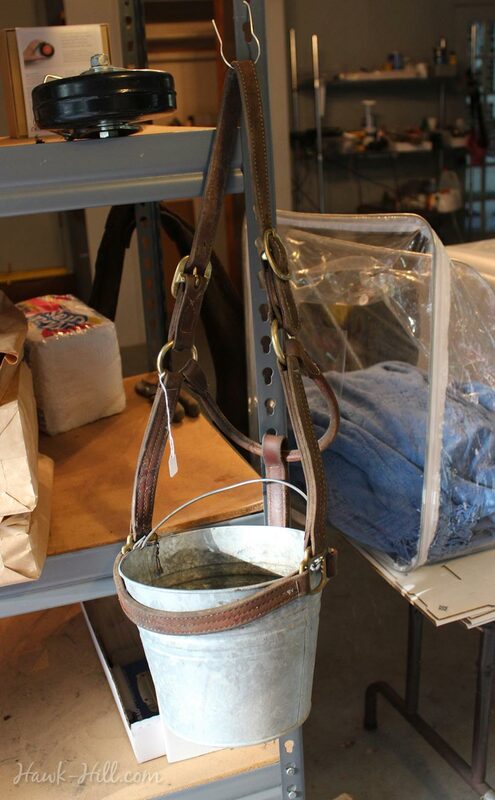 Ordering online is always a gamble when sizing is tricky, but might be worth it to get a rustic looking bucket- especially if your halter has an adjustable noseband that can be cinched down around a bucket. The largest bucket from this set (shown below) might work great for this project. Whatever bucket you choose, just make sure it’s tapered from top to bottom and has a lip that protrudes on the outside of the rim. pre-aged buckets can also be used, if the new galvanized buckets are too shiny for your taste. Really there’s just one important step between finding a bucket that fits and getting started, and that’s punching holes in the bottom of the bucket. When you plant flowers it’s important that the soil be able to drain off excess water, and 2-3 holes in the bottom of the bucket should do the trick nicely. Finally! We’re ready to add halter to bucket and secure the pair in partnership. The following three photos show how I secure a bucket to a halter. 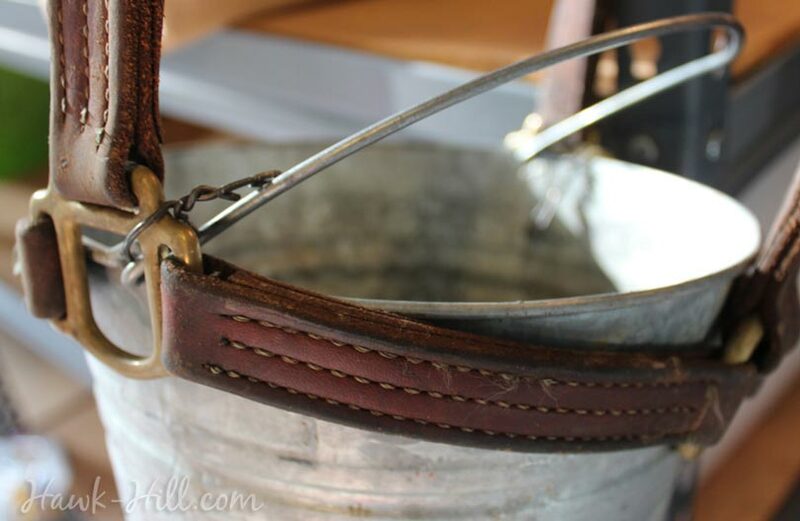 Theoretically, the leather strap, plus the bucket’s taper and rim prevent the bucket from sliding through, but when creating a hanging planter it’s better to be safe than sorry and reinforce that connection. 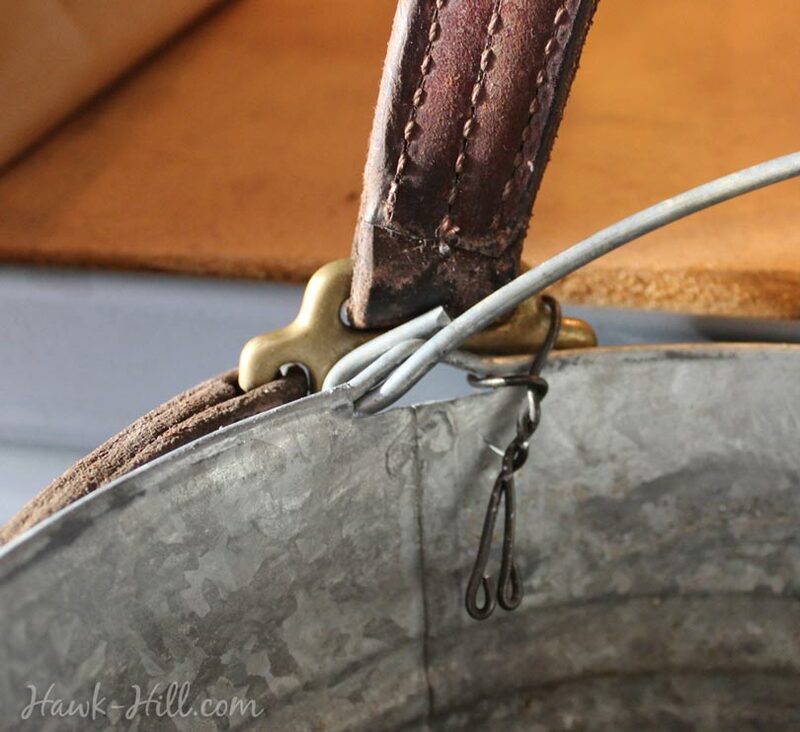 To be on the safe side, I use medium/heavy gauge wire to connect the bail of the bucket handle to the metal of the halter squares, as shown. 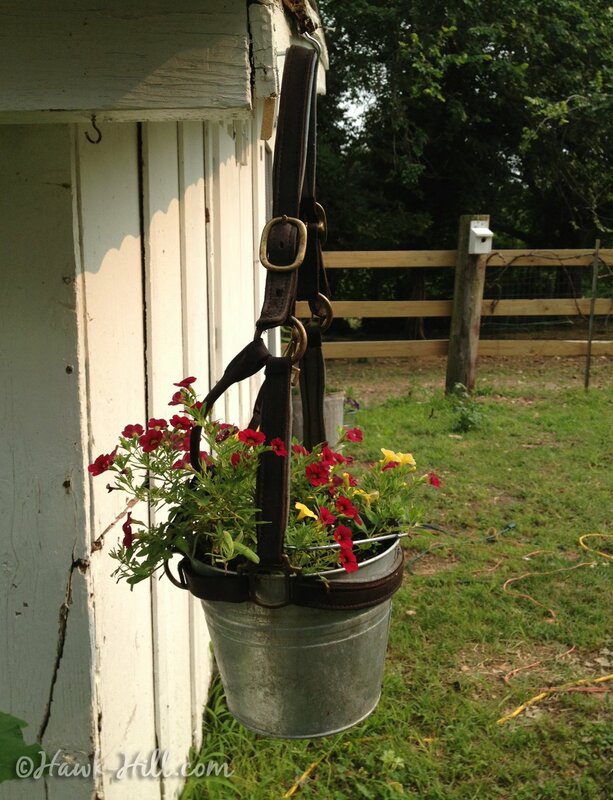 A loop and a few twists is enough to hold a full bucket of moist soil & flowers even if the noseband were to fail in it’s job of holding the bucket in place. When finished, I bend the twisted ends of the wire downward into the bucket, where they won’t show. Be sure to blunt the ends of your wire using a tight loop. Don’t skip this step! Unblunted wire ends can wound hands innocently probing for soil moisture months later. These planters do NOT look good when planted with upright plants or plants more than 6-8″ tall. Keep this in mind when selecting and planting your flowers. I recommend a flower with a mounding/overflowing growth style and multiple small blooms. Calibrachoa is the flower variety shown in the image below and through that growing season it grew even larger and mounding around the sides of my bucket. Moneywort (aka Creeping Jenny) is a good choice for co-planting. Creeping Jenny doesn’t really bloom, but the growth pattern is very low and it drapes in long flowing branches, creating a cool look for hanging planters. That’s it! It’s so easy. 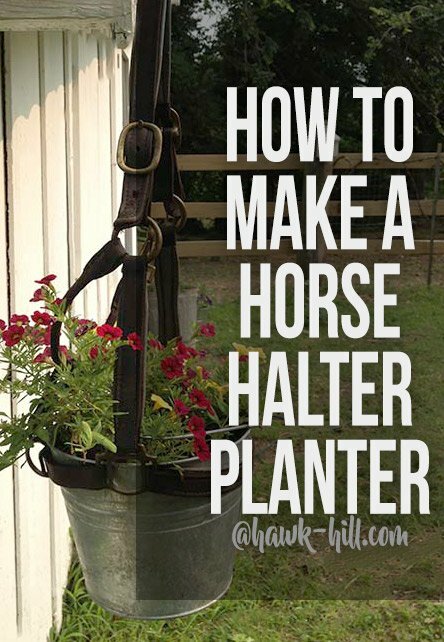 Don’t let the length of this post fool you- once you’ve got the right size bucket and halter, this is a 5 minute project that you can enjoy for at least a few growing seasons.